Break out your favorite tri-cornered hat for a rollicking holiday happening. Break out your favorite tri-cornered hat for a rollicking holiday happening on June 16 and 17, 2018. NORTHERN CALIFORNIA PIRATE FESTIVAL: It's been swashbuckling people right into the start of summer for ay, a good long piece of time, and fans return for the costuming, the eats, the activities, and as a way to have a fun Father's Day to-do with Dad and all the family, if the family is also into buckled shoes and the tales of the high seas. 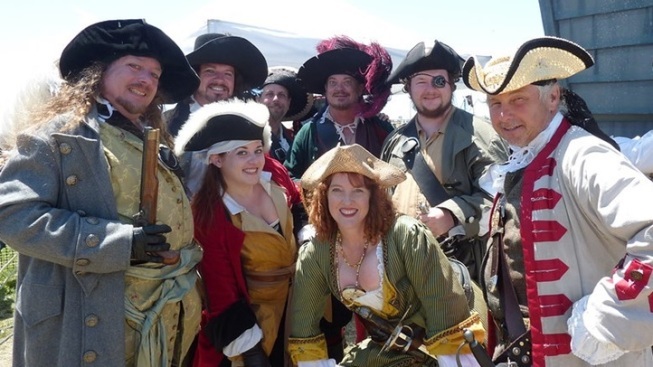 The 2018 dates are Saturday, June 16 and Sunday, June 17, a ticket is twelve dollars (modern dollars, not ye olde pirate doubloons) at the gate, and, indeed, it is right on the water, a pirate festival should be: Vallejo Waterfront Park is the spot. AS FOR THE AVAST-Y ACTIVITIES? A shoppable area of "Fyne Wares" may be found on the grounds, there shall be kidly to-dos, like a costume contest, as well as "Sea Shanties, Thundering Cannons, Juggling Dare Devils, Historic Pirates, and so much more." Stop polishing your hilt and invite your parrot to hop upon your shoulder; it's time to find out, er, fynd out more information about the popular weekend-before-summer shindigs in Vallejo now.